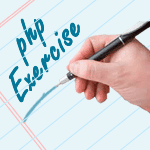 Write a PHP program that accepts six numbers as input and sorts them in descending order. Input: Input consists of six numbers n1, n2, n3, n4, n5, n6 (-100000 ≤ n1, n2, n3, n4, n5, n6 ≤ 100000). The six numbers are separated by a space. 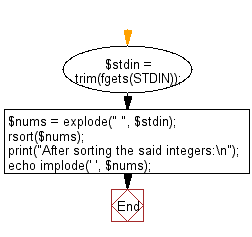 Previous: Write a PHP program to compute and print sum of two given integers (more than or equal to zero). If given integers or the sum have more than 80 digits, print "overflow". Next: Write a PHP program to test whether two lines PQ and RS are parallel.